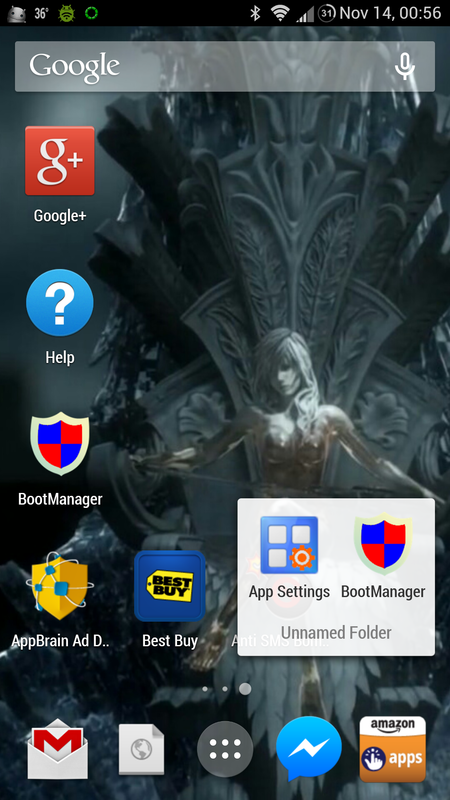 If you’re rooted, get Xposed and App Settings. Changing Google Search’s DPI will dynamically change the amount of real estate onto which you can put more/fewer shortcuts and/or widgets. 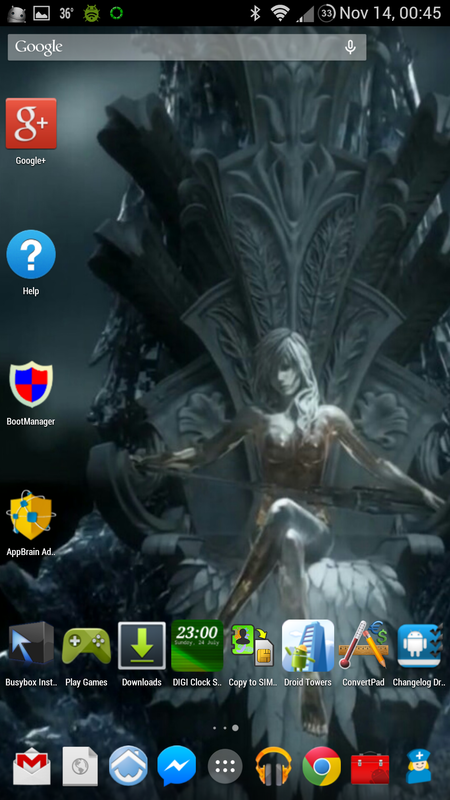 For example: on my SGS4, setting its DPI to 350 makes it 6 columns wide by 6 columns high with 6 available slots in the dock bar (42 total on one screen). 250 makes it 8 columns by 5 rows with 8 dock slots (48 slots total). The stock SGS4 DPI of 480 results in a launcher with 4 columns by 4 rows and 4 dock slots (20 slots total). The app drawer also changes dimensions with the DPI. Open folder @ 480 DPI. You can add screens by dragging a shortcut or widget off the right side of the screen. You can make a folder by dropping a shortcut onto another shortcut which, when open, can be renamed by clicking “Unnamed Folder”. Add shortcuts by dragging them from the drawer (accessible by clicking the circle with 6 dots on the dock) and dropping them where you want them. 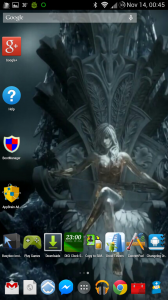 Long-click an empty slot or click the menu key to access wallpapers, widgets, and Google Now settings. You can also drag the screens around in this view. Click “Widgets” and drag a widget to a screen and drop it where you want it. Some widgets are resizable. Long-click the widget to pick it up, then drop it in the same spot. If the resize square shows, you can resize it. 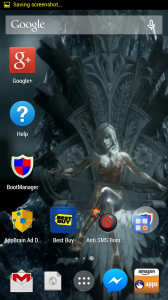 Swipe all the way to the left to access Google Now. You can fling shortcuts and widgets to the top of the screen to remove them from the screen. You can’t hide the labels on the shortcuts or folders. 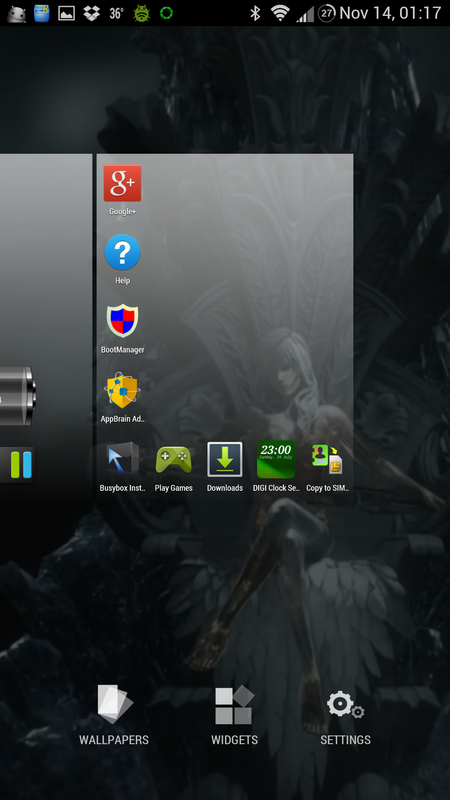 Most widgets can’t be resized. The action bar at the top will stop short on the right if the DPI is too low. 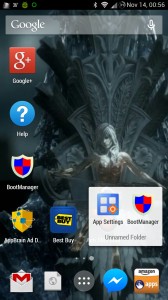 You can’t move the app drawer shortcut. You only get one dock. You can’t access the phone’s settings except by adding the Settings shortcut to the launcher or clicking the button on the notification panel. It doesn’t rotate with the screen.